Below are the complete details of the Teacher jobs in Ace International School & College System in Karachi Mardan Sargodha. Skills Required for Job: Having Good Communication Skills. Having Good Team Working Skills. Confidence. Every teacher needs to have confidence, not only in themselves but in their students and their colleagues. Communication. Being able to communicate with not only your students but with parents and staff is an essential skill. Team Player. Continuous Learner. Imaginative. Leadership. Innovative. 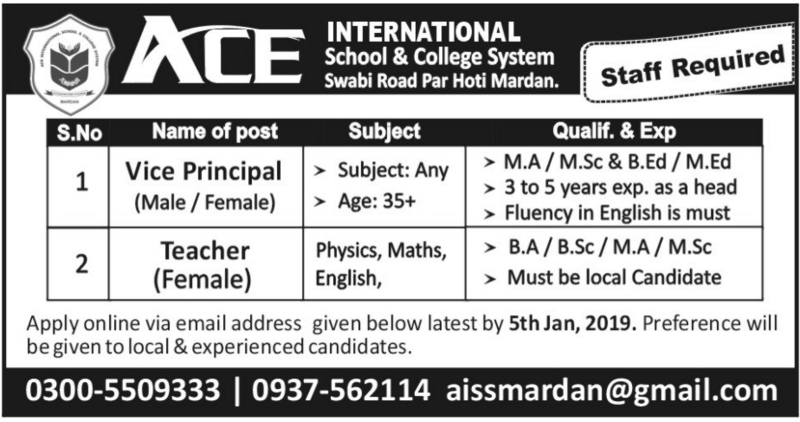 Qualification: Ace International School & College System Mardan Jobs For Teacher. Required Qualification: BA/ B.Sc/ MA/ M.Sc from Recognized University/ Institution. Attractive Salary Package. Last Date for Submission of Application 15th January 2019. 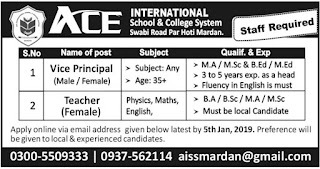 Teacher jobs in Ace International School & College System Karachi, Mardan, Sargodha, in Pakistan published on Paperpk.com from newspaper on December 29,2018. Job seekers who are already working as English Teacher , Chemistry , Biology Teacher , Female Vocational Teacher , Teacher , Female Teacher , Maths Teacher , Montessori Teacher can also apply for post of Teacher.